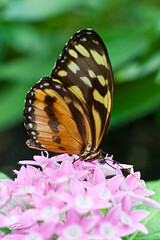 This butterfly was spending a long time drinking from this flower giving me time to work it a little. The problem was still a lack of light to get the depth of field I'd have liked. Even at ISO 800 (which is as far as I like to push the D700 under normal conditions) I was only shooting at 1/90 second at f/9.